Laugh all you want while headbanging along to Steel Panther’s satirically swaggering take on ‘80s-era Sunset Strip glam metal, but there’s just no arguing with the ferociously slamming chops of guitarist Russ “Satchel” Parrish. 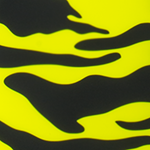 Simply put, nobody puts the 1987 into today like Parrish and his metalloid feline cohorts, and Charvel is excited to deliver a huge horns-up in the tiger-striped form of the Satchel Signature Pro-Mod DK Bengal. 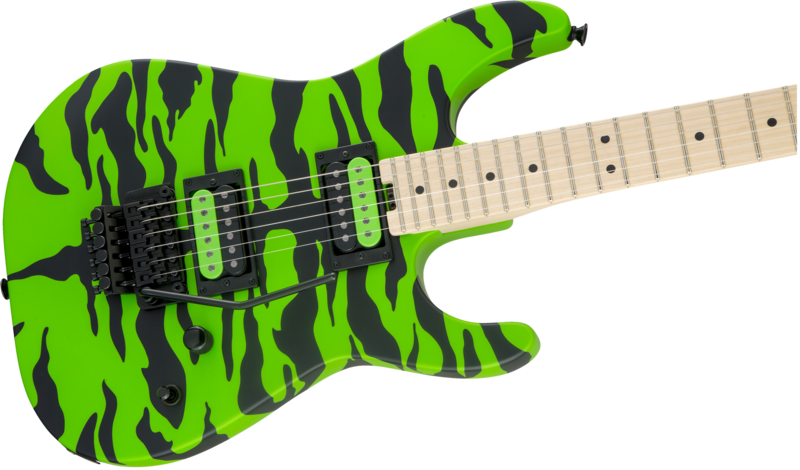 The instrument has an alder Dinky™ body with sharper-radius top edges and an all-new flamboyant Slime Green Bengal or Yellow Bengal finish. 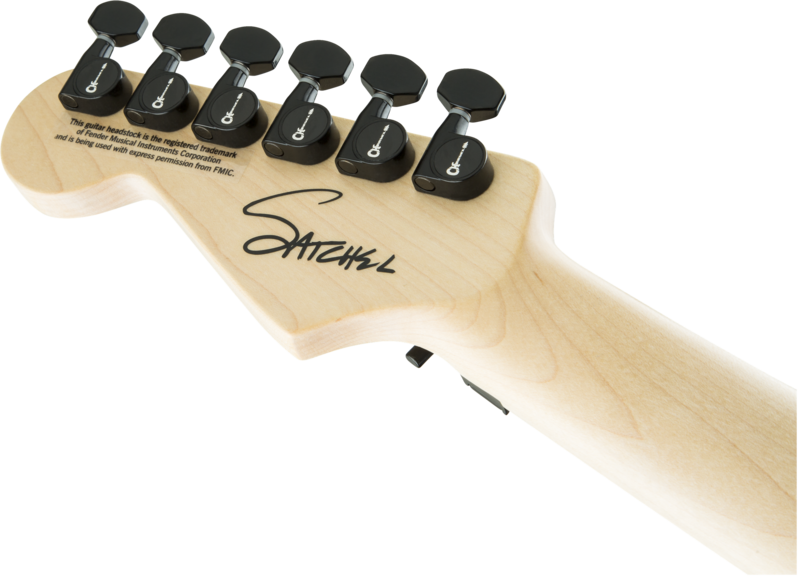 Of special note are the two Fishman® Fluence Classic humbucking pickups, which share a single volume control knob with special push/pull dual voice activation. Using this control, the PRF-CHB-NB1 neck pickup delivers ideal-but-elusive vintage PAF humbucking neck pickup tone with just the right dynamics and output (voice one), or a Fluence-exclusive neck tone with clear and airy chime, unreal high end, highly vocal midrange and tight lows (voice two). Similarly, the PRF-CHB-BB1 bridge pickup delivers ideal vintage PAF humbucking tone calibrated for perfect output (voice one), or quintessential hot-rodded humbucking bridge tone without all the baggage (voice two). You get the idea—it sounds %$#@& huge. 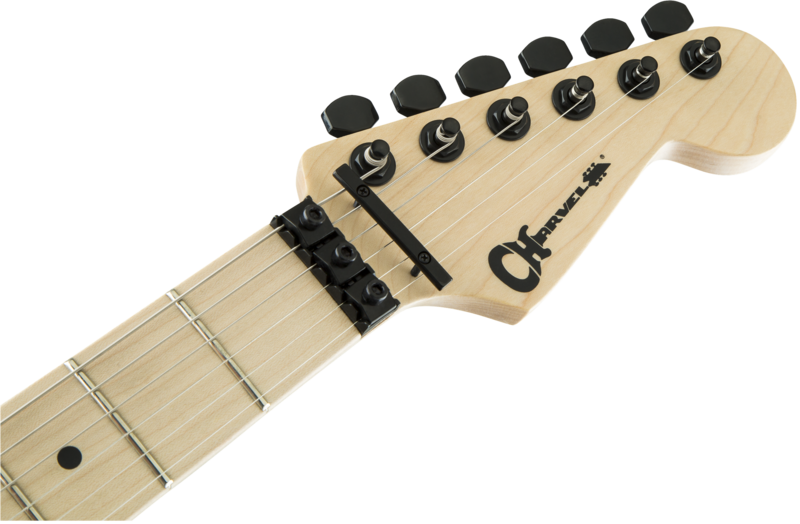 The two-piece bolt-on maple neck has a Fender® Stratocaster® headstock with Charvel-branded die-cast tuners, graphite reinforcement, heel-mount truss rod adjustment wheel and Charvel neck plate. Atop that is a 12”-16” compound-radius maple fingerboard with 22 jumbo frets and offset dot inlays. 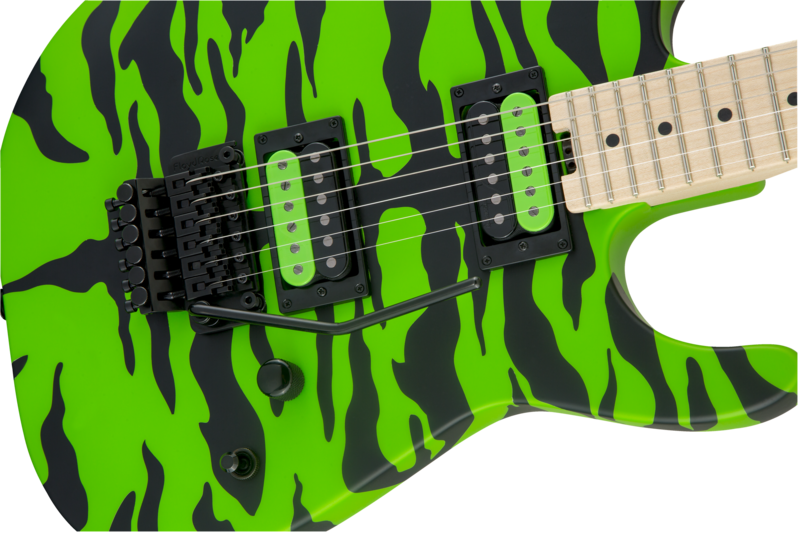 Other features include a three-way toggle pickup switch, top-loaded Floyd Rose® 1000 Series double-locking tremolo bridge system, and more.